The Tampa Bay Buccaneers will induct Tony Dungy into the team’s Ring of Honor on Sept. 24, the team announced. The longtime head coach will join the Buccaneers’ Ring of Honor during a halftime ceremony of Tampa’s game against the Steelers on Monday Night Football. Dungy will become the 12th member of the Ring of Honor, and the third former head coach to have his name placed among the franchise’s all-time greats. Founding head coach John McKay was the second person inducted into the Ring, in 2010; he was joined last year by former head coach Jon Gruden, who succeeded Dungy at the helm and led the 2002 Buccaneers to their first Super Bowl title. Named the sixth head coach in franchise history on Jan. 22, 1996, Dungy has the best winning percentage among all Buccaneer head coaches. In his six seasons on the job, he guided Tampa Bay to a 54-42 regular-season record and to the playoffs four out of the six seasons. The Buccaneers’ first playoff victory in 18 years came after beating the Detroit Lions 20-10 in the NFC Wild Card game in 1997. The high point of Dungy’s tenure was during the 1999 season, when he led Tampa Bay t0 11 wins and a trip to the NFC Championship Game, before losing to the St. Louis Rams 11-6. He would coach through the 2001 season before his tenure as Buccaneers head coach came to a close at season’s end. Dungy would be hired by the Indianapolis Colts, with whom he won Super Bowl XLI, 29-17, over the Chicago Bears. He was the first African-American head coach to win a Super Bowl. 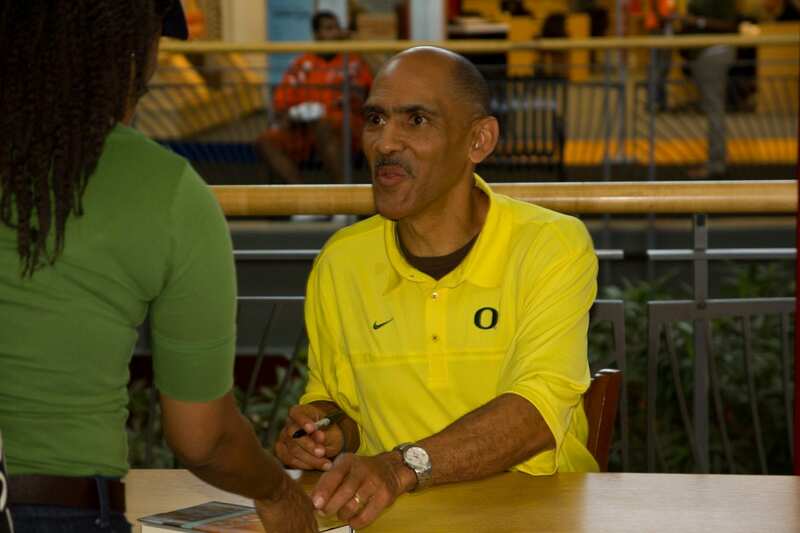 Grounded in his Christian faith, Dungy in 1997 helped found the Tampa-based non-profit organization All Pro Dad, which uses NFL players and coaches to stress the importance of being a good father. He’s now an analyst for NBC Sports and remains a revered figure in the pro football community. “God has expectations of you in this business. You’re a lamp and how you carry yourself is very important in the midst of the spiritual challenges,” Dungy said to Sports Spectrum.